With Mt. Bachelor and several other excellent ski areas from which to choose, Bend Oregon skiing is some of the best in the country. Winter visitors to Bend often come for the great skiing. In addition to Mt. Bachelor Ski Resort just west of Bend, which boasts over 380 inches of dry powder each year, there are several other excellent Oregon ski resorts from which to choose – each with its own unique characteristics. Overview – If you’re taking a winter trip to Bend, Oregon, skiing at Mt. Bachelor is a must. One of the Pacific Northwest’s most popular resorts, Mt. Bachelor’s 10 lifts provide access to 3,600 acres of pristine snow. Season – The closest ski resort to Bend, skiing at Mt. Bachelor begins in November and ends in May. Price Range – Adult lift ticket prices run $96. Location – 21 miles west of Bend via the Cascade Lakes Highway. Overview –Skiing Bend, Oregon is not limited to Mt. Bachelor. Hoodoo Ski Area provides a great alternative for those who prefer a smaller resort where lift lines are rare. Hoodoo offers a variety of runs, night skiing, Nordic trails, and a tube park for those who want to ski Bend Oregon. Season – Late November through late April / early May. Price Range – Lift tickets are $58 for adults. Location – 40 miles northwest of Bend off Highway 20. Overview – This remote resort southwest of Bend is another great option for those interested in Bend, OR, skiing. Tucked deep in the Deschutes National Forest, Willamette Pass Ski Resort has 555 skiable acres, two terrain parks, Nordic trails, and a tube park. Season – Late November through the end of March. Price Range – Lift tickets are around $60 for adults. Location – 72 miles southwest of Bend, via Highway 97 to Highway 58. Overview – Notorious for spectacular backcountry skiing, Mt. Bailey boasts over 6,000 ungroomed acres and up to 18,000 vertical feet of guided cat skiing in pristine powder. Season – Late November through mid-April. Price Range - $385 per person per day. Location – 98 miles southwest of Bend via Highway 97 to Highway 138. Overview – One of the most popular ski resorts near Portland, Mt. 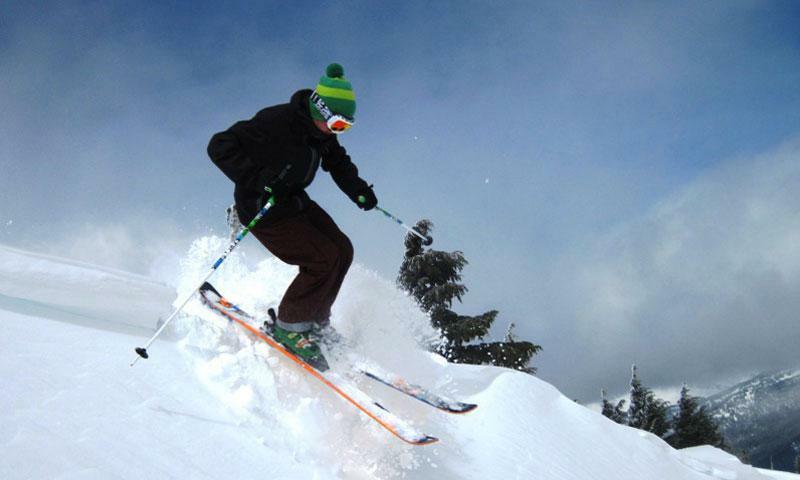 Hood Meadows is Oregon’s largest ski areas with over 2,150 skiable acres. Located on the highest peak in the state, the resort offers both day and night skiing, several terrain parks, and a variety of Nordic trails. Season – Late November through April. Price Range – Lift ticket are $82 for adults. Location – 111 miles northwest of Bend via Highway 97 to Highway 26. Overview – Mt. Hood Ski Bowl has the country’s largest night skiing area and more black diamond runs than any of Oregon’s other resorts. Skier and boarders can enjoy 960 skiable acres and two terrain parks. Price Range – Lift tickets are around $57 for adults. Location – 107 miles northwest of Bend, via Highway 97 to Highway 26. Overview – Located at the top of Mt. Hood, Timberline Ski Resort offers 1,415 skiable acres and 3,690 vertical feet. It’s the only ski resort in North America that’s open year round. Skiers and boarders can enjoy both day and night skiing, snowcat skiing, and 5 terrain parks. Season – Open year round. Price Range – Lift ticket prices run around $76 for adults during the winter season. Location – 107 miles northwest of Bend via Highway 97 to Highway 26.